It’s going on five years since I got married and I still can’t “quit” weddings on Pinterest. More specifically, reception sweetheart tables. They are like the “white box challenge” (old school HGTV Design Star reference, anyone?) 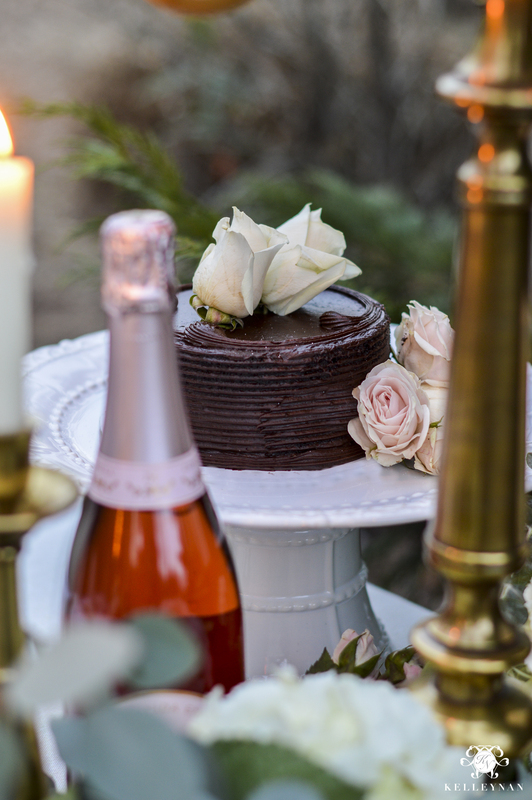 of entertaining – there’s only a finite blank canvas but the options and creative direction are endless. Truth be told, I didn’t actually have a sweetheart table at my reception. (You can check out some of my wedding HERE). But, I’m totally addicted to the head table details and when I joined Lory of Designthusiasm for another Styled + Set Holiday Entertaining Blog Tour round (check out our Thanksgiving entertaining HERE and Christmas HERE), I was excited to pull together a romantic outdoor sweetheart table, fit for a wedding and perfect for Valentine’s Day. It’s still winter (did winter actually ever arrive?) but here in Georgia, temperatures have been close to 70. Grab some throws for a chill when the sun sets but with those warm temps, there’s no reason not to dine al fresco. 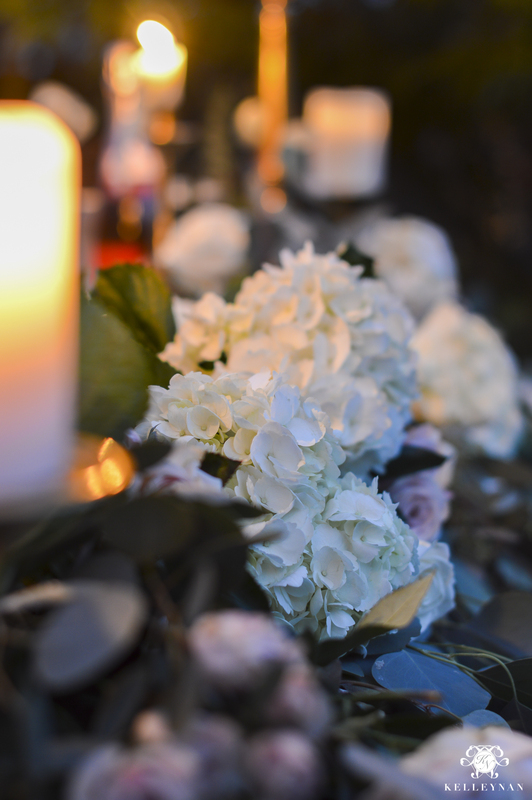 As I’ve talked about before, I’m less about the literal hearts and more about the romantic vibes… bring out the candle light, champagne, flowers, and sweets! While their permanent home is on the breakfast buffet (see the recent transformation HERE), I use these candelabras (SIMILAR) every chance I get to really make a statement. 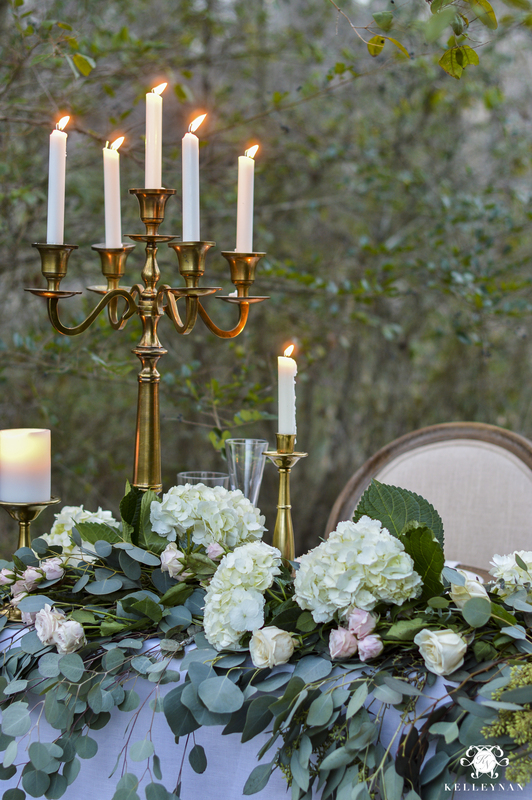 On a smaller scale, my brass candlesticks from Pottery Barn (HERE) are used the most often. You don’t have to be elaborate to make your dinner special… just doing something different will make it special. Sometimes, all you need is a new location, new scenery, or a new recipe. *I thought I was using dripless candles and realized within a few minutes of lighting them, that they most definitely were NOT. If you have tips to remove wax from tablecloths, let me know in the comments below! 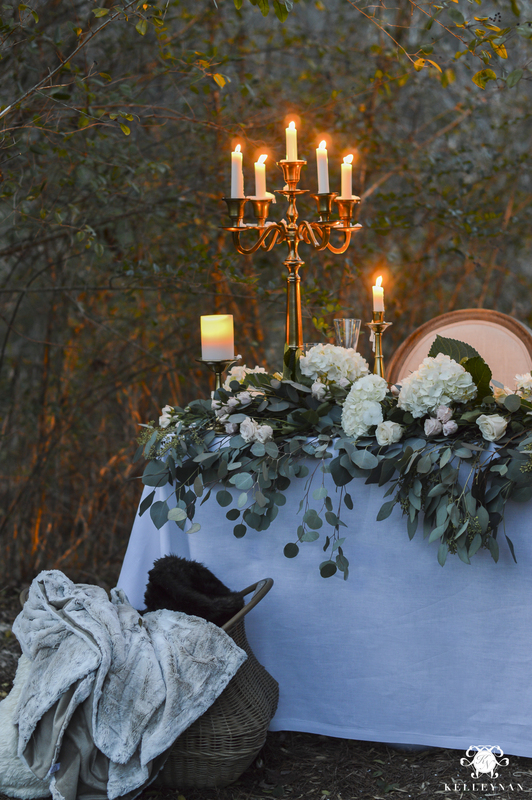 For the next stop on the tour, head to my talented friend Kris of Driven by Decor. I brag on her often (and if you have visited with her before, you know why 😉 ). She has a way of turning little touches and details into big, brilliant ideas! To make sure you catch all the posts, here’s a list of all who are participating today and throughout the week. I decorate an elaborate dessert table for my church’s annual marriage seminar. I’m always looking for something new and special to decorate the tables with. 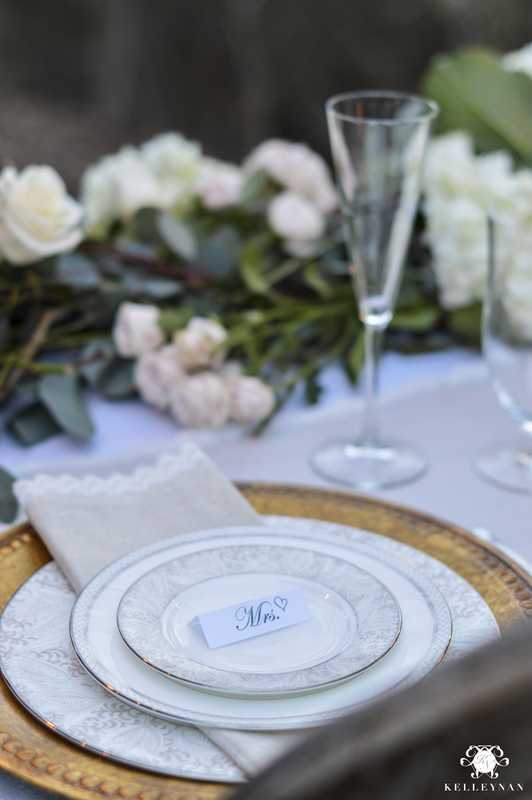 It’s not a wedding or reception but I want it to feel equally special…especially for those who have left small children at home and rarely get away! My budget is limited so I am curious if you have any ideas of doing something as stunning as this table but on a tight budget? Thank you and well done! OMG! This is incredible Kelley! So beautiful and romantic! I haven’t tried this but I’ve heard that freezing the wax first (yup, put it in the freezer) and then scrape the frozen wax gently with a butter knife. Launder as usual, and if there is still residue, place a piece of wax paper on the area, turn linen over and iron the underside. Any remaining wax should melt into the wax paper leaving you with a clean and pressed linen. Such a good tip! Thank you, Maria! Bree, I just love you! Ahhhhmazing kel!!! I love mixing roses and hydrangeas!!!! It reminds me of my wedding. This is so stunning. Kelley, this turned out amazing!!! I can totally picture you in a flowing lace dress barefoot and flowers in your hair. You have created a beautiful vignette that belongs in a fairtale, only thing missing are the woodland sprites. Jen, thank you, thank you! If only everyone could have seen the state I was in that night- briar patch and hair a mess haha! 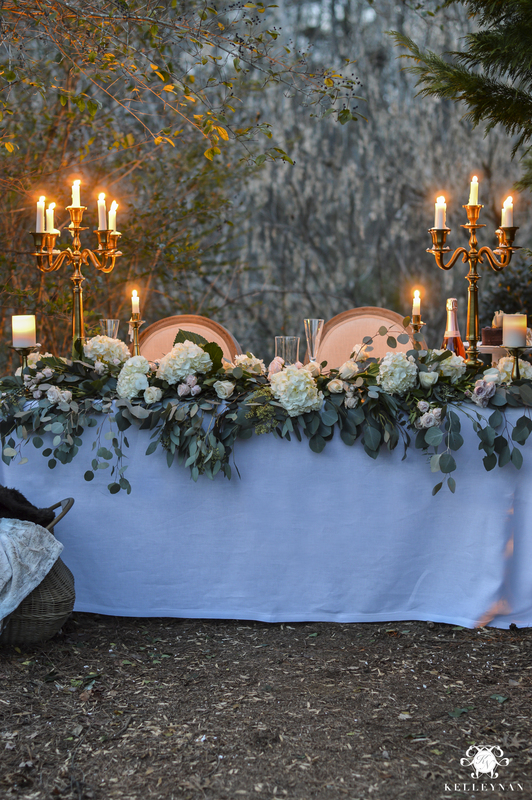 What a gorgeous outdoor table setting! Kelley, this is absolutely STUNNING! 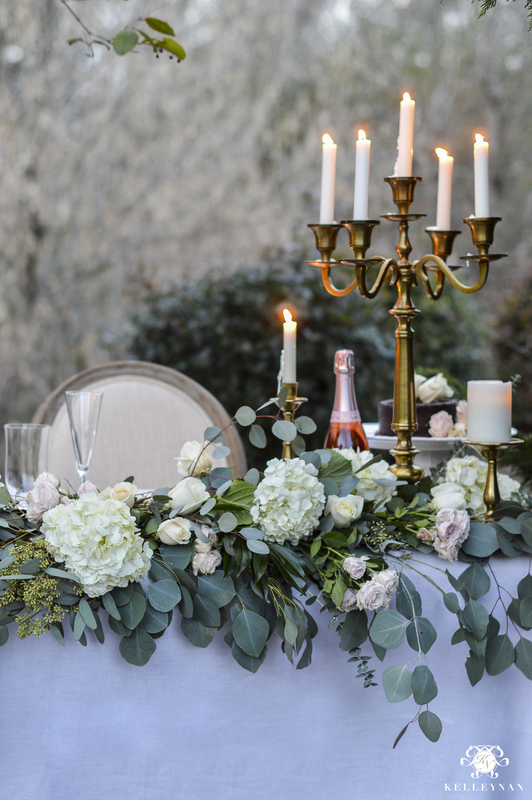 Love a floral table runner & the candelabras add a perfect touch to make it romantic! 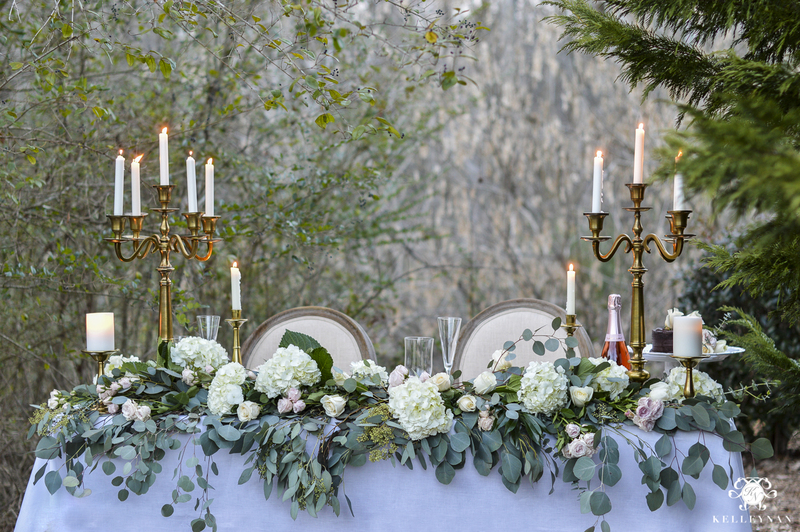 This might be one of my favorite tablescapes if yours! Kelley every detail of this sweetheart table was magical! You are so talented and what an inspiring pretty post! What a stunning table! For wax on tablecloths, after you have scraped off the chunks, you can also try putting several layers of kraft paper (or unfolded and flattened brown paper bags) under the tablecloth, and one layer over the top and ironing over the kraft paper (with the iron at a low temperature setting). The porous kraft paper will absorbed the melted wax. There may be an oily spot remaining that you can treat in the laundry or have dry cleaned. Oh my goodness, such a good tip! Thank you! Aw, thank you!! I loved creating this little spot! 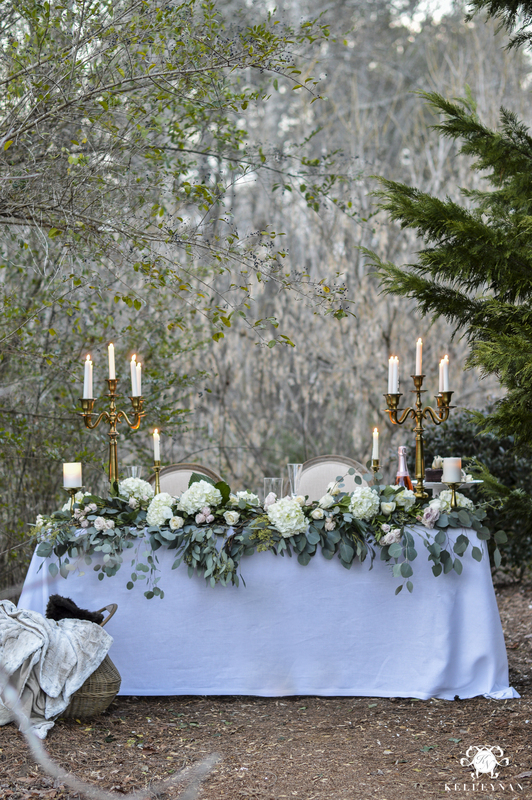 Kelley, your sweetheart table is absolutely stunning!! The floral garland is just magnificent. I’m a big eucalyptus fan myself. It has such wonderful drape. Funny you mention dripless candles because I actually LOVE the look of super drippy candles and have tried really hard to create that look. I think it has to do with being outdoors… 🙂 In any case, I love the look. My go to trick for removing candle wax is to put items in the freezer and often you can then just flick the wax off. Not sure if it works so well with fabric though. Love this beautiful table! Janet, thank you! 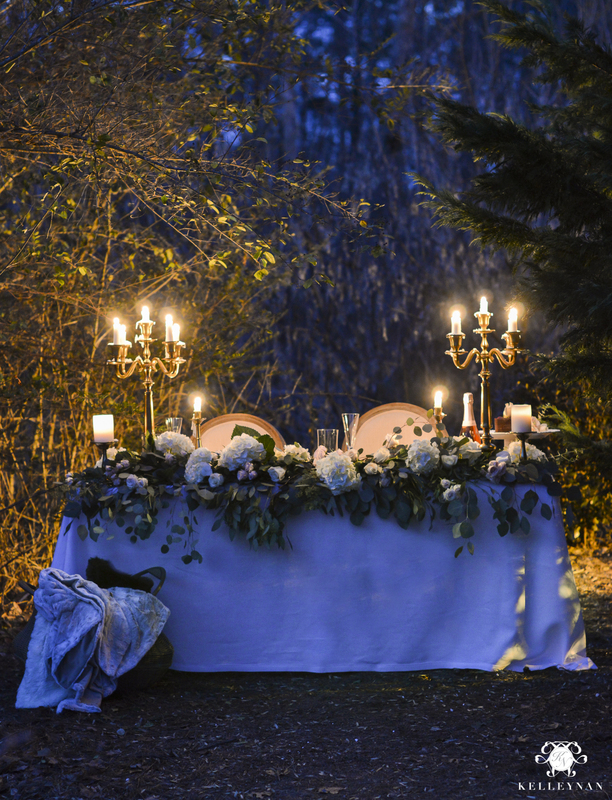 I always love your romantic tables! 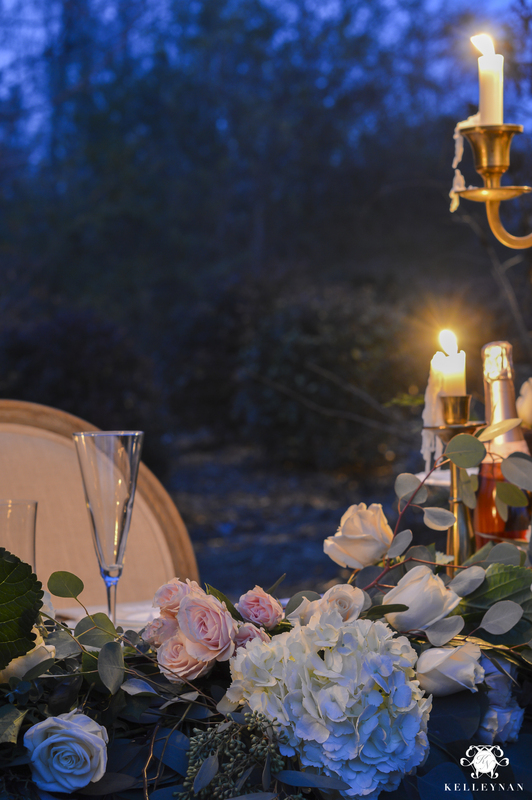 Your Outdoor setting is so romantic. I wish I had a back drop like yours. Outstanding. Would you believe this is up at our amenities area, behind the trash cans? Look around- I bet you have pretty alcoves in the most unexpected places! This is stunning. I am going to try it sometime, maybe on a smaller scale:) Were all the florals from Trader Joes? Hi, Kathy! That’s awesome! They were 😉 They ALWAYS have the eucalyptus.